The Sulphur Creek Trestle Battle Site is located one mile south of Elkmont, Alabama in Limestone County. The remains of the fort sit just east of the former Nashville & Decatur railroad line which ran north/south. The bulk of the Sulphur Creek Trestle Battle Site is located on private property without public access, the exception being the railroad bed, which is now part of the Richard Martin Trail and is owned by Limestone County. 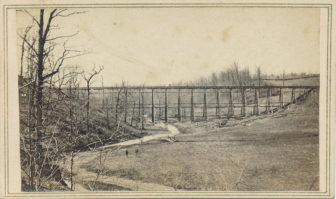 The Battle of Sulphur Creek Trestle, also known as the Battle of Athens, was fought near Athens, Alabama, in Limestone County, Alabama, from September 23 to 25, 1864. In September 1864, General Nathan Bedford Forrest led his force into northern Alabama and middle Tennessee to disrupt the supply of William Tecumseh Sherman‘s army in Georgia. 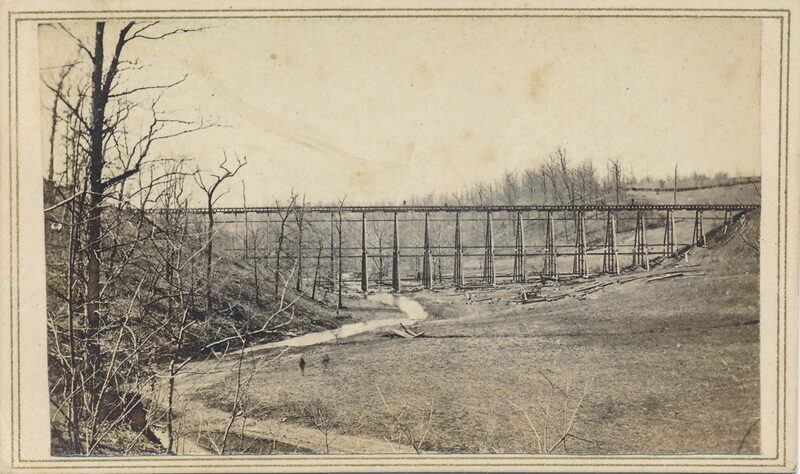 The Sulphur Branch Trestle Fort was originally constructed by the Union Army to defend the strategic trestle bridge across Sulphur Branch Creek on the vital Alabama & Tennessee Railroad. This railway was a critical Union line of communication for the transportation of logistics and troops. The fort consisted of prominent earthworks for exterior defense, with 2 blockhouses built in the fort’s interior to provide a secondary means of defense. 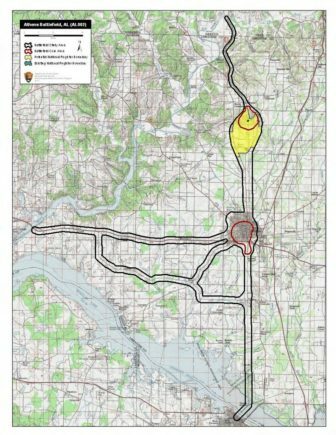 On September 25, after defeating Union forces at the Battle of Athens, Confederate cavalry forces under Lt. Gen. Nathan B. Forrest continued a campaign to severely disrupt Union supplies in North Alabama. He attacked the Sulphur Branch Trestle Fort, first engaging Union advance troops. This initial encounter was followed by a sharp artillery barrage against the fort’s interior. During the Confederate artillery assault, the fort’s commander, Col. Lathrop, was killed. The fort’s remaining defenses were eventually overwhelmed, and the remaining defenders surrendered. After the surrender of the fort, Forrest reported the capture of several hundred troops and 2 artillery pieces. The fort, its 2 blockhouses, and the trestle bridge were burned. After the engagement at Sulphur Branch Trestle, Forrest continued his campaign of destroying and disrupting other import railway bridges along the Alabama and Tennessee Railroad. Many of the white Union soldiers captured here were sent to Castle Morgan. Castle Morgan, also known as Cahaba Federal Prison, was a prisoner-of-war camp in Cahaba, Dallas County, used to house Union prisoners during the Civil War. The black Union soldiers captured were put to work on the continued construction of Mobile’s defensive earthworks. Neais Hcntsville, Ala., September 30, 1804. For good information on Civil War Fortifications see this site.